Pad Cha in Thai refers to the practice of making your wok so hot that when you add the ingredients, they literally explode. That’s what makes this dish so tasty. The flavours, especially the chilli, suddenly explode. This dish can be made with mixed seafood or just lobster! A thank you to Chef Saiphin Moore from Rosa's Thai Cafe for the recipe! Using a mortar and pestle or a food processor, pound or blitz the coriander root, garlic, chopped galangal, lemon grass and chillies into a paste. Heat the oil in a wok set over a medium heat. Stir-fry the paste you have made for a few seconds until it is fragrant, then stir in the oyster sauce, soy sauce, sugar and black peppercorns. Add the squid, prawns, mussels and scallops, tossing to combine. Season with the fish sauce, then add the lesser galangal, green peppercorns and onion and combine well. Pour in the Chinese rice wine and measurement water. Cook over a medium heat for a few minutes until everything is cooked through. 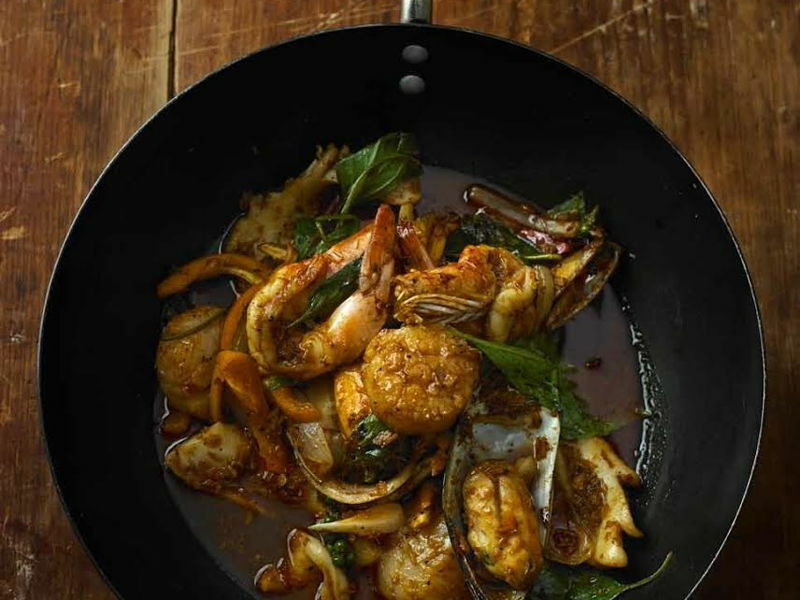 Garnish with sweet basil leaves and serve hot with jasmine rice.